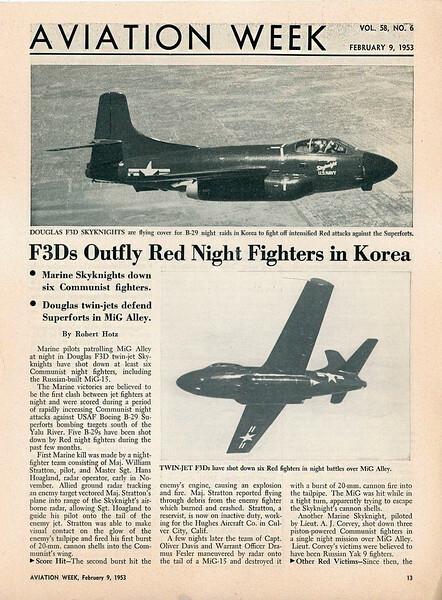 The Douglas F3D Skyknight, (later F-10 Skyknight) was a United States twin-engine, midwing jet fighter aircraft manufactured by the Douglas Aircraft Company in El Segundo, California. The plane''s portly profile earned it the nickname "Willie the Whale". The F3D was initially intended as a carrier-based, all-weather aircraft. It saw service with the United States Navy and United States Marine Corps, downing several MiG-15s over Korea, and serving as an electronic warfare platform in the Vietnam conflict. The F3D was not a typical sleek and nimble fighter, but as a night fighter packing a powerful radar system and second crew member, it was not intended to be. It originated in 1945 with a U.S. Navy requirement for a jet-powered radar-equipped carrier-based night fighter. The Douglas team led by Ed Heinemann designed around the bulky air intercept radar systems of the time, with side-by-side seating for the pilot and radar operator The result was an airplane with a broad, deep, and roomy fuselage.